A Complete Done For You, Profit-Producing E-commerce or Affiliate marketing Business With Coaching So You Continue Profiting On Your Own. Are you making the kind of money that you want online? Have you bought courses, software, and WSOs after WSOs and still no return? I am going to let you in on some little secrets. This is not a WSO that will sell you dreams and not deliver. This is a life-changing WSO. I am not going to tell you this WSO will make you $1 million dollars a year because I do not even earn half of that. 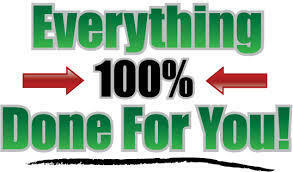 What I am offering in this WSO is the same very profitable online businesses I am running for myself and clients. Would you like to finally succeed online? Would you like to be making lots of profit, while we do all the work for you? Well, Your dream has finally come true! eCommerce business done for you. You find an offer, drive traffic it and make sales. you may make a sale here and there, but that is not a sustainable business. You see, consistent sales = high converting funnel + targeted traffic. I am sure you have heard the phrase "The Money Is In The List", right? And that is very true, but all list are not built equally. The money is actually in your "relationship" with your list"
You need to build a trusting relationship with your subscriber. You want them to be looking forward to your emails every single day. This and much more is what makes a funnel a high converting funnel. Once you create a high converting funnel next is to send targeted traffic. Most marketers will rush to use solo ads, which is not a very bad source but brings low or hardly any profitable sales. You want fresh subs who are not seeing hundreds or even thousands of offers a day. This can be achieved using good old Bing ads and Adwords. Also, FB ads, 50onred and much more. Essentially, all this is simple, but not easy. and it takes a lot of money(thousands) and time to master different traffic sources. So, why not let someone else who makes $277,400+ a year after taxes with affiliate marketing avoid those mistakes and YOU reap the benefits? 1. Good offers and products to promote. Starting a profitable e-commerce business is hard work with many steps and decisions that need to come together at the right time. Anyone who says it is easy is definitely a novice. The first step to building an e-commerce business is to know what products you want to sell. This is often the most challenging part. Once you have determined what product to sell, you must now figure out where and how you are going to obtain your products. Once you have determined where to obtain your products, the next step is to build your store. Your store must be built very SEO friendly and have a HIGH TRUST FACTOR. Once Your store is built, it is time to market it. Most people will run to FB ADS first, but that is all wrong. FB ADS are great but it should be done last after you have the right demographic data. Other sources such as bing, AdWords should be used first to generate sales. All this is simple, but not easy and that is why I am here to help. 3. Targeted Traffic: We will create and manage your FBAds, Bing Ads, Adwords, Native ads and PPV ads for 60 days to ensure your store is in profit. Unfortunately, our DONE-FOR-YOU program is not for everyone. This is only for those who are ready to take action and are willing to invest in their business success. This is for those who have tried and failed again and again, but have not given up but are now ready to finally succeed. Those who have tried everything to succeed online and offline too and failed... This will be your chance to make it online. Those who will not treat this as a business, those who treat the online business as a hobby People who are already making $100,000 a year online. 1) What Other Expenses Are Involved Besides The Cost Of The WSO? Domain name, hosting and Ad spend. 2) What Is The Average Ad Spend/day Needed For This System To Work? The average Ad spend depends on your budget. 3) Why Are You Offering This Service? First, I love helping people achieve success. Second, I need reviews for something big I am launching. This is the best and fastest way to ensure my clients make profit. I have decided to stop this seller from selling a Warrior. I honestly don't feel this is the type of offer I want to see here. I see many red flags, delay in offering the refund, aggressive seller, the product seller is selling is a product/service that requires a serious investment and I don't think this seller provides a service that we can guarantee what it claims it offers. I'm well aware the seller offered refunds but the refund didn't go smoothly enough, therefore in the best interested of buyers I have decided to suspend this seller. People like this have no place on this forum. He is a massive scam artist. he ripped me and my partners off. we had him build 2 sites of which he "guaranteed" would be profitable in 90 days or less. well after 6 months of zero profit along with wasting almost $15,000 of our ad spend he got no results. then he promised us a full refund plus half of our ad spend. well he never delivered and disappeared. after finally tracking him down he said he wouldnt agree to that even though HE put it in writing in a contract. so then he agreed to pay our full investment for the 2 sites without the half of adspend he wasted to be paid in a few days because he needed to "get a loan from his bank" in order to pay us back. days came and went and he never paid and has thus since stopped replying to any and all messages. This guy is a total scam artist and should be banned from this forum. He gives all the true business men and women on here a bad name. And yet somehow this guy is allowed to continue on this forum scamming others. BEWARE THIS LIAR HE WILL STEAL YOUR MONEY AND WASTE YOUR TIME. I see why History is His story. You are omitting a lot of things and this story is not accurate. First of all, no one disappeared, I have been in the hospital. Second, you even have both of my phone numbers. Third, you paid me $2497, so why should I refund you $3500? Also, I wanted the stores back in exchange for the refund which you refused including all the disrespect and threats you gave me. Last but not least, you are lying about the numbers. Below are screenshots of all the adcost and profit from your store. You can make a video showing the details so we can verify who is saying the truth. Now when will do the simple math to calculate profit and loss, you will see it ends up to -$2057.15 so how did you come up with $15k? Anyone who does ecom knows it is all about data. I told you, it is only a matter of time and we will hit $10k in profit because we now have data to optimize. But you wanted a refund which I agreed to but I wanted the stores back and you refused. You are bitter because I deleted the campaigns I created. So you basically want a refund of more than you paid me, then want to keep the stores and all my campaigns. I am glad that this scammer got exposed. Do NOT work with him! doesn't deliver, always make excuses, and only only speaks when he wants money! I honestly thought you were a good person who says the truth. You did not purchase my WSO. You already had a store not making any profit. You contacted me asking if I could help make it profitable. We agreed on monthly terms and I began. Immediately I started, sales began flowing in. Fast forward to month two you disappeared and did not respond to my messages, only for you to come back later and said you had internet problems. And I asked you for payment for the next month for me to continue then you got mad. On top of all this, I made videos for you and even got on live sessions with you, to show you how to run traffic for the new store you were setting up. So you say you delivered ?!! Man you really got nerve to even talk!! You promised to make profits in 3 months, and you didn't..and after that you said well that eas an estimate!! First you said you will add products and then you didn't, said you woll go for $10,000 a month, in less than 3 months, and didn't, and only show up, when you want money!! Man you really are a scam..you deserve to be banned for LIFE!! You never Purchased my WSO... You had a store already built wrongly and I tried to fix it. I generated you sales and lots of it, I was in the process of optimizing before you disappeared. Also, can you remind me of how much you paid?. Please tell me what you purchased before and after me that ever got you sales? I UNDERSTAND ENGLISH IS NOT YOUR FIRST LANGUAGE BUT YOU SHOULD AT LEAST KNOW THE MEANING OF THE WORD SCAM. Your Store Now Without Me, 260 sessions in a day and no single sale, I now understand why you are mad. Lol man, you get a screenshot of my sales and say you made them ?!! Can you deny that you didn't add products when you said you will? Can you deny that you said you will make profit the first 3 months and you didn't ? Can you deny that you only show up when you want money ? Can you deny that you failed every promise you made ma ? And now after knowing you, I do know what scam means! Are you saying these sales are not from the traffic campaigns I set up? And you still have not answered my questions. Can you remind me of how much you paid?. Please tell me what you purchased before and after me that ever got you sales? You can lie all you want, that is between you and your God but I will prove it here. It is a different thing to be unsatisfied about a service and a different thing to call it a scam. Just one question, can you sau that you delivered what you promised ? And rest assured, I don't lie, I am well raised and know how to treat people with respect, you did set up campaigns, but did you make the profit you promised ?!! Why are you not answering the questions I asked? So I did not make the profit that was promised that means scam? Can you please answer my questions so I can show clearly the negative narrative you are trying to paint. I just removed the "payment option" for this WSO based on lack of support .... also contacted the user. But payment link is still available? Chucks is a Scammer! He couldn't make any money with the websites and then promised a refund which never happened. He continually lied about sending funds but never did. Now he is silent. I have all his personal info and will be getting back my money 1 way or another! 1) I set up everything you paid me for. 2) We made sales but not enough to be profitable. 3) You got a refund. If I did not approve it, you would have never got it. They wanted me to fight it but I said they should issue the refund. We can put it to the test and I will appeal it. There is only one client that will not be getting a refund from me. Coach promised a refund a while back. No refund came from him. I filed a paypal dispute. Will keep you posted. I´m sorry this happened to you, I almost hire him as FB expert to handle some of our clients projects, thanks God I didn´t do it. I hired someone who gave me splendid results. I´m sorry this happened to you, this kind of people affect other honest warriors in this forum, Thanks to give us an Alert, you should also to let the administrator know about this issue. yeah, I am talking to Gabriel about it. has anyone had any luck getting their money back ? Just wanted to let you all know I'll be posting my update soon. I want to make a video, explaining how things are going, so it'll take a little while. I love Coach Chuks. He is the best coach money can buy. I love the way he teaches--it's very interactive, and he records your coaching sessions, so if you forget something, you can always go back and watch. He seems to be available 24/7, and is genuinely interested in your success. You would be doing yourself a disservice by spending money on another program or another coach! Here's an update: I just made my first sale! One customer bought 3 products, and I made a nice profit! I could not have done it without the help of Coach Chuks. He is the real deal and is a no-BS type coach. Thank you, Coach Chuks! The store is brand new, so no sales yet, but I am sure we'll see some soon. We've had frequent sessions, and after everyone we make good progress. I'll keep you all posted on the progress of things. Looks great so far. Is there any slot available..
Was this result from an e-commerce only purchase or a combo? Ecom purchase only. If you purchase the combo, you get two businesses. Could be two ecom businesses, two affiliate businesses or one ecom and one affiliate. Hey is there any option available for the installment payments as I am in dead end at current state. Hey you are not responding to my question . I wish also to know how much profit is it the initial investment that I do to you $1497will I get this back in a month ? Hello for ecom Business how much I need to invest monthly for advertising . I have very tight budget is there any solution for you ? Once I see sales pouring I can reinvest . Also do you do Marketing as service ? I am one of those who bought this, we are working now on optimizing my store, got two sales actually about two days ago..and still tweaking stuff. Chuck seems like a guy who knows what he is doing, I really hope I will come soon and post my next review saying that we got to 5 figures already. Hello Coach, is the Affiliate/Ecom site 2 different sites or just one? Offer is closing soon, next person gets the last and final spot. Next Launch will be in April with a price increase. Can you pm me your Skype please..
WF cut my ability to pm due to ridiculous policies...thanks. Pm sent. In case you did not get it. I just purchased the DFY Affiliate Business. I will provide updates and results as they come in. Stay tuned! Has any body tried this and gotten positive results ? Previously I bought 2 DFU ecommerce store, one shopify and another woo-commerce store in this Forum and both left me stranded with a half-baked site that I had to make a big overhaul of the site by myself and also OPs doesn't deliver and help and even one Miss--In-Action. Sample of your $10k funnels. Mike sells his for $5k.... and has years and dozens of reviews. What makes your worth 2x his offering?